The American people are disgusted with the U.S. Congress. In 2014, public approval of the "first branch" of government reached a forty-year low, its popularity ranking well below Nixon during the Watergate years and BP during the oil spill. Congress has been producing legislation at a historically anemic rate, while many of the nation's most immediate problems fester. Those are the facts. The fiction? The notion that we can't do anything about it. Two-and-a-quarter centuries ago, the U.S. Constitution assigned various powers and obligations to our legislative branch -- a written warranty calling on our elected representatives to "promote the general welfare." But failures in recent years reveal a profound truth: Congress is in breach of contract. More than ineffective, the legislative process has become defective. And to a great degree, it is the congressional system that is driving the problem, not just the people and parties who are stymied by it. It is time to stop labeling them all "fools." Instead, we the people must push to reform the rules. In UNLOCK CONGRESS, veteran journalist and former political strategist Michael Golden examines the ways in which congressional failure generates a harmful PRODUCT. Rather than narrowly affixing blame to individual politicians or even to the partisan divide, Golden methodically diagnoses underlying causes behind the breakdown. He identifies the PROBLEM -- obsolete rules that lead to major defects within the system. 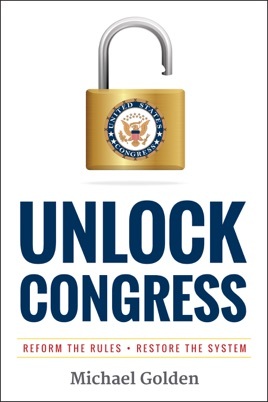 Finally, Unlock Congress lays out a PLATFORM of solutions designed to reinvigorate both the process and its players.